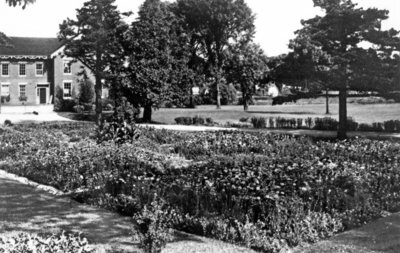 Black and white negative of a photograph showing the lawns and house of Joshua Richardson. The house is visible in the background at left. This home was built in 1876 at 720 Dundas Street East on the north-east corner of Dundas and Garden Streets. It was demolished in 1969. In 1936 the Richardson residence became the office and plant of Alger Press of Oshawa. This photograph was likely used in Alger Press calendars. It was originally printed in colour and was one of the fist colour photographs of Whitby. Joshua Richardson Residence/Alger Press Building, c.1936, unknown photographer, Whitby Archives, 17-118-001.